Oklahoma lawmakers plan to use ‘rainy day’ funds, cash reserves, the state’s unclaimed property program and county apportionment funds to help bridge a $611.3 million gap, the House Appropriations Committee chairman said Tuesday. 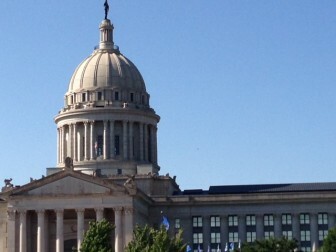 Rep. Earl Sears, R-Bartlesville, said the four funds would cover “well more than half” of the budget gap. Sears said cuts to state agency budgets would cover the remainder. Last week, sources told Oklahoma Watch that lawmakers were looking at taking between $100 and $140 million from the rainy day fund and could tap agency revolving funds for more than $100 million. At least $30 million from the unclaimed property program is also expected to be taken for the budget, along with some funds normally earmarked for county government. Sears said part of the budget agreement will include cuts to most agency budgets “in the area” of 7.25 percent. “I would call the agency spending cuts ‘significant spending cuts,'” he said. In addition to reductions in spending, Sears said lawmakers want to change the way revenue is earmarked for county governments. Right now, counties get funds from state motor vehicle taxes. Most of those funds are earmarked for the county improvements for roads and bridges fund, used by county governments to finance transportation projects. In 2014, motor vehicle taxes generated $748,902,618. Sears said lawmakers wouldn’t take money from the CIRB fund itself, but instead want to change the way tax revenue was allocated to county governments. The proposals are already drawing fire from county officials and legislative Democrats. The first session of the 55th Oklahoma Legislature ends on May 29. The number of state inmates being kept in county jails has long been hard to track. A new law is aimed at making the count more precise.